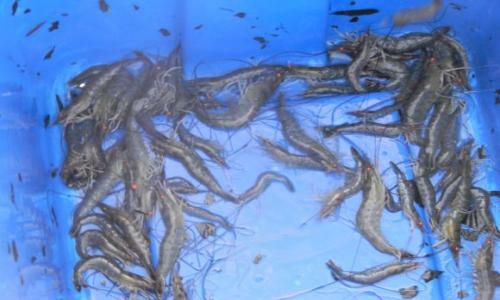 With the exception of earthworms, live shrimp is the most widely demanded fishing bait along the southern coastal region. Live shrimp is preferred by many and usually purchased at the local bait shops. But if you live in an area of brackish water or along the beaches, shrimp can be caught. Shallow water shrimp (as opposed to deep water ocean shrimp) are often estuarine dependent which is good news for those of us who like to catch our own bait. For example, along the upper St. Johns river in North Florida around late summer to early fall, shrimp can be hauled in literally by the cast net full. There are two cast net methods used. The first used during daylight hours employs a cast net with sewed on webbing about 4" above the net's sinkers. The net is cast into the deeper waters where the shrimp congregate. The sewed on webbing acts as a wing keeping the cast net fully open as it sinks to the bottom to depth of sometimes 25 to 30 feet. The net must come to rest on the bottom. This will generally catch several dozen. 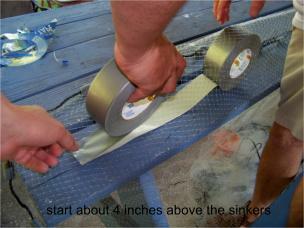 If a cast net does not have a sewed on webbing simply use two rolls of duct tape and sandwich the net between the two sticky sides of the duct tape about 4" above the sinkers. Be careful not to tape up the draw strings around the cast net, ensure the draw strings are outside the taping as you go. Be sure to tape around the full circumference of the net. Use a table top to help manage the process and keep in mind that once the taping is complete, you can not remove the tape. The second method used to cast net shrimp occurs after dark. At night, shrimp in many estuaries move into shallow water generally around 5 feet or less. Hang a lantern that shines over the water surface, use a little shrimp meal as bait and soon the shrimp will come in. Be sure and check your local fishing regulations for any restrictions on using a cast net. If fishing along a saltwater pier or bridge at night, hang a lantern over the side to shine on the water. 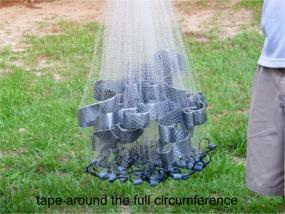 Keep a long handled 1/4 inch mesh dip net ready because shrimp will come to the surface to check the light out. Or build a push net using 1/4 inch mesh netting on a triangular or rectangular rigid frame with a handle attached. This is fished by being pushed across the grassy bottom by a person wading. Because shrimp need lots of oxygen, keeping them alive requires some type of aerated live bait system. Several styles of aerator systems are available including Fish Saver Portable Aerator kits which allow common cooler to be used as an aerator tank. "One of my favorite baits of all time would have to be live shrimp. It has been credited with putting more fish in my live well than any other bait. It can be fished on a bottom fishing rig or with a float rig near the surface. Shrimp can be effective either dead or alive, of course, alive is always the preferred method if possible. When fishing with live shrimp its best to hook the shrimp behind the head, but be sure to stay clear of the black spot, if not you will have fresh dead shrimp. 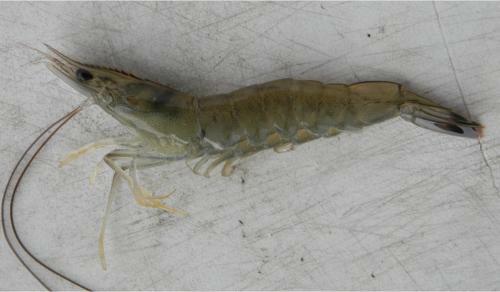 Live shrimp can also be hooked in the tail and fished effectively, although some tail action may be reduced due to the hook. When fishing shrimp on the bottom I like to use a 1 oz. slip egg sinker over a black 18 inch steel leader tipped with a 1/0 circle hook. This is the method I use 95% of the time and it’s very rare that I'm not heating up grease in the pan for fillets that evening. When using a float rig I like to use just a float and a 1/0-2/0 circle hook with no sinker. I generally give about 2-3 feet of line from the hook to the float. This rig baited with a live shrimp fished around docks is also deadly. When fishing dead shrimp on the bottom I use the same rig mentioned above but I hook the shrimp in the neck and kind of thread it on the hook like you would a worm. There are times that the fish seem to like the dead shrimp better than alive, you just have to try it for yourself and see which way works better for you on your fishing trip. 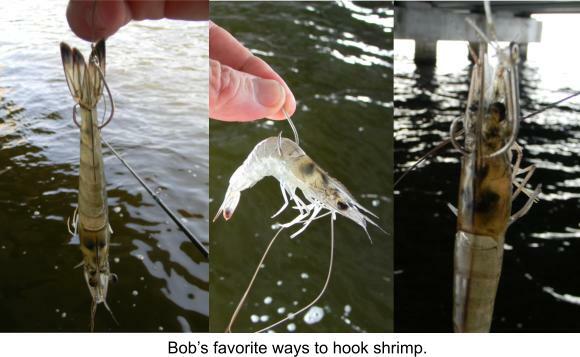 Either way you try it, you will not be disappointed with your choice of using shrimp for bait, dead or alive." One final tip, if you are after pan fish and need bait, take a wide mouth, small mesh, dip net and push it along a grassy, aquatic plant covered area in shallow water. Odds are you will load up on grass shrimp.